UNV became operational in the United Nations Mission in Liberia (UNMIL) when it first deployed on 1 October 2003. From then until the end of the Mission’s mandate in March 2018, more than 1,200 UN Volunteers from more than 80 nationalities supported the Mission in substantive, administrative and technical areas. 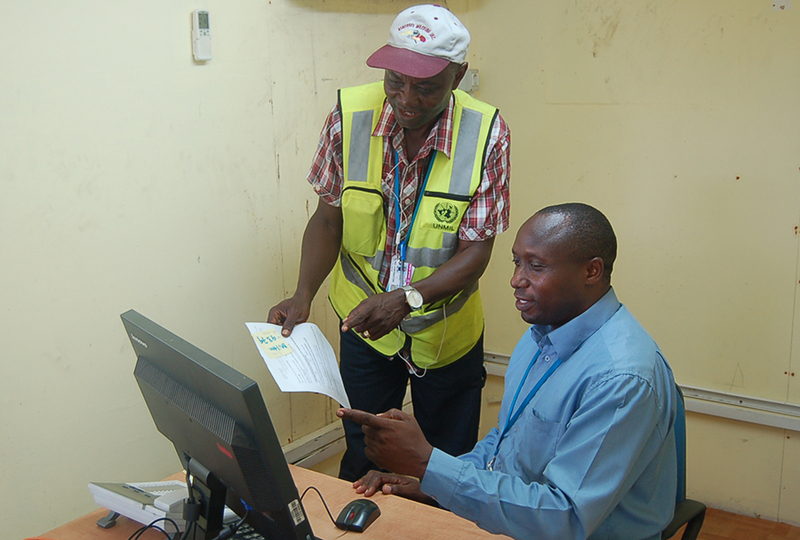 Patrick Ndalila (Kenya, standing), UN Volunteer Transport Dispatch Assistant with UNMIL, discusses work processes with a colleague in the mission. UNV’s ability to rapidly deploy highly qualified volunteers in large numbers made a difference for UNMIL in the early days. UNV participated in a Technical Assessment Survey of the UN Department of Peacekeeping Operations before the Mission deployed. Closely involved in the Mission’s planning, UNV was able to deploy 48 volunteers in January 2004 alone, sending in 225 UN Volunteers by the end of the year. In the initial months, UN Volunteers operated under very difficult circumstances, with minor supervision, as line managers had not been appointed yet. For instance, the gender and quick-impact project units were run for many months solely by UN Volunteers, while other sections relied extensively on UN Volunteers. UNV reintegration officers and camp managers were vital to the successful demobilization and reintegration of more than 100,000 combatants by October 2004. Amongst the UN Volunteers during those times were a CNN journalist, a former judge, two former diplomats, a former fighter jet pilot, as well as published writers. By the 11 October 2005 election, which led to the presidency of Ellen Johnson Sirleaf, 550 UN Volunteers had been recruited. Almost 200 provided electoral assistance to the National Elections Commission. During the Ebola epidemic between 2014 and 2016, 220 UN Volunteers were deployed with UNMIL. More than 80 per cent of them stayed on the ground, at the peak of transmission, playing an essential role at a time when many staff members had left. They served in all areas, including in challenging positions in the field with the UNMIL medical section. They were also instrumental in the set-up and operations of the UN Mission for Ebola Emergency Response (UNMEER), on the ground in 2014-2015. Some 30 UN Volunteers supported the 2017 elections. UNV also mobilized volunteers to teach at national universities. UNMIL has been a creative mission from a staffing perspective. Like other missions, most of the UN Volunteers came from outside Liberia. However, as of July 2016, 16 national UN Volunteers were included in UNMIL’s budget for the first time, 11 as Field Liaison Officers in counties where the Mission had already withdrawn, usually supporting the superintendents’ offices. During the last two years of its mandate, UNMIL began recruiting Online Volunteers to provide assistance in areas vacated by retrenched staff. An UN Online Volunteer editor completed the One UN Annual Report, and two UN Online Volunteers designed outreach material on sexual exploitation and abuse. Since its inception, UNV has been supporting vulnerable populations in local communities, such as the students of the schools for the blind and deaf, through feeding programmes, water repairs, fence construction, etc. Recently, the UNV field unit mobilized funds to donate school materials, clothing and construction materials to five schools in Liberia. Other projects aimed to reduce poverty and provide livelihood opportunities for people with physical challenges. UN Volunteers catalyzed volunteerism in Liberia by supporting the National Youth Volunteer Service, the Volunteers for Peace Programme, the ECOWAS Volunteers Programme, as well as a platform for volunteerism at the community level. Their support has ensured that more and more Liberians embrace the idea of volunteerism as a tool for the maintenance of sustainable peace and development. In addition, for almost 10 years, UNMIL Radio has aired “Volunteers’ Voices,” showcasing the role of volunteers in Liberia. UNMIL has been unceasingly relying on UN Volunteers: by the end of the Mission’s mandate in March 2018, 1 out of 3 international civilian personnel in UNMIL was a UN Volunteer, and during the transition from UNMIL to the UN Country Team, UNV become a strategic partner, assisting UN agencies, funds and programmes in implementing their mandates.